Typically, you’ll want to work with additional templates for your HTML5 and CSS3 website. Fortunately, there are hundreds of great templates available, and you can easily build your own. Here’s how to add additional templates. Locate the template you want online. Download a template or two that you like. When browsing templates, remember that you will be able to modify them. If you don’t like the particular colors or images, you can change them later. Save the downloaded .zip file somewhere on your local machine. Log in to WebsiteBaker as admin. Only the administrator can add new templates to the system. Navigate to the Templates page of the Add-ons section. This is where you install and uninstall downloaded templates. Click the Browse button to locate the .zip file on your local system. Load the entire .zip file containing the template onto the server. Click the Install button to begin the process. You receive a notification when the installation is complete. Installing a template does not apply the template automatically. In Settings, apply the new template. Specify the template to display from the drop-down list of templates. Use the Preview button (or reload the currently showing version of the CMS) to see the new look. 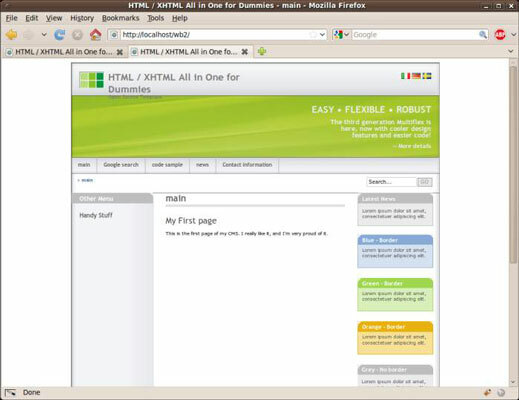 The Multiflex-3 template is one of the most commonly used templates on the Internet. The original design was built with plain HTML/CSS implementation in mind but has been ported to nearly every CMS including WebsiteBaker. The design is a solid and very flexible starting place. After you get to know it, you’ll recognize it all over the place.